Tonight on FOX Masterchef returns with an all new Wednesday, July 13, Season 7 episode 7 called, “Vets, Jets and Home Cooks,” and we’ve got your MasterChef recap down below! On tonight’s episode, the remaining 15 cooks split up into two teams for their second major field challenge, which involves prepping and serving a steak, two side dishes and a sauce for 101 veterans, whose votes will determine which group will face the pressure test. On the last episode, the remaining 16 home cooks got a very special treat leading into the next challenge, as Chef Ramsay demonstrated how to properly deconstruct a lobster. Did you watch the last episode? 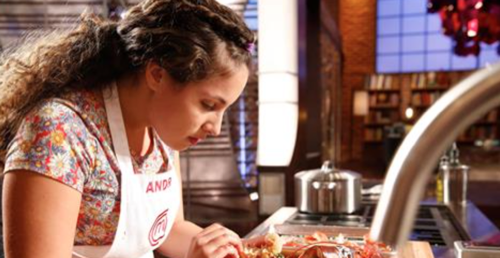 If you missed it, we’ve got your MasterChef recap right here for you. Tonight the judges and returning guest judge Aarón Sanchez took the top fifteen out of the kitchen and to a nearby airfield for their second Team Challenge. Team Challenges were a test, but the key to winning them was all about communication and leadership. Will the team captain lead his team to victory of failure.? So tonight Alejandro had been given a very unique choice. Alejandro had been offered the chance to pick which team he wished to be the captain of so he could have picked either the Red Team or the Blue Team. Yet, he ended going with the Blue Team because the two teams hadn’t changed all that much since their first team challenge. The two teams had been given the option of choosing who they wanted to work so the Blue Team mostly consisted of everyone that was on the original Blue Team during a disastrous wedding reception. However, after Alejandro chose to captain the Blue Team, the Red Team got to vote amongst themselves and pick their own captain. So they decided to go with David over the captain that has been tried and true. And while everyone might have hoped for the best with their choices, they were all shouted at in the end by Chef Ramsay. Ramsay had told the contestants that they were going to be cook lunch for a hundred and one U.S. veterans and that tonight’s challenge was about honoring the troops yet both teams went on to embarrass him in one way or another. The Blue Team had decided to cook Hanger Steak with Chimichurri Sauce, Mashed Potatoes, and Brussels Sprouts and apparently Shaun’s overconfidence worked against them and D’Andre couldn’t even handle something like mashed potatoes. So the Blue Team continuously sent out too much of well-done meat because Shaun swore that his honey marinated steaks weren’t going to get burn on the grill and they also got shouted at because D’Andre was honestly going to send out mashed potatoes without salt. Yeah, he forgot to add salt to the water as he was cooking the potatoes. But the Blue Team’s minor difficulties in their kitchen managed to look small compared to that of the Red Team. The Red Team had started out strong what with their much simpler Hanger Steak with Grilled Zucchini and Borbon Mushroom though towards the end they kept running into the same problem. They had lost their cohesiveness and unfortunately, David just could not bring them back to their starting point. So their dishes were missing a few things here or there and they also had burnt steaks as their main problem. And that led to a lot of their dishes getting sent back to the kitchen. So when it came time for the veterans to judge, they had to choose the team that at least consistently fed them so they ended up going with the Blue Team and that meant the Red Team were the ones facing the Pressure Test. Though the judges decided to make the Pressure Teat extra hard by throwing in a complication. The judges had apparently wanted the Red Team to decide who amongst themselves should be safe from elimination and they said if they didn’t choose in the next three minutes then they were all going to be eliminated right there on the spot. Yet, the problem with choosing who should be safe and under such pressure was the fact that everyone wanted to be safe. So they all would have chosen themselves if they had been asked individually, but thankfully they hadn’t because the judges wanted the team to decide and so the majority of the Red Team had elected to save Eric. Eric had taken over the meat station and had worked tirelessly there so the team felt he should be safe because of that amount of effort. Their team captain on the other hand had been the one holdout. David hadn’t thought that they should save Eric and he had only gone along with the others because he had no choice. David, though, was still angry that his team voted to keep Eric safe over himself. David had felt that he should be safe because he was the captain and couldn’t be in charge of the meat because he had to watch over all the stations as the captain. However, no one else felt that way so that’s why it was only the majority of them that voted to keep Eric safe while the rest of them underwent the pressure test. Only David didn’t let go of his anger and he was still angry even as he cooking to save his place in the competition. Tonight’s pressure test was all about cooking fried chicken and surprisingly cooking fried chicken could be incredibly hard. So everyone that was cooking in the pressure test should have been focused on the pressure test yet David had been chopping up his meat so angrily that Ramsay actually had to stop by his station to ask if everything was alright. Though David said that it was because he said that he was going to be focusing all of his anger into cooking the spiciest fried chicken he could. And so he had still been trying to throw shade as they were all cooking to stay on in MasterChef. But David’s fried chicken did turn out all right even if it wasn’t perfect and so the only advice that Ramsay could give him was that he was going to let some things go. So David had been saved by a somewhat ok chicken and being in the middle worked for him because there had been a lot worse to judge on tonight’s pressure test. The judges had tasted Katie’s dish and had found it underwhelming. Her chicken wasn’t fried all over and the taste wasn’t enough to carry it through and both Diana’s and Manny had been burnt beyond all recognition. Manny’s fried chicken had been left heating for too long. So the skin on his chicken had been mostly charred to death while Diana’s fried chicken didn’t even look like fried chicken because this was the first time she’s ever cooked it and she literally took a guess about what to use. And so tonight’s bottom three wasn’t really a guess, it was just a forgone conclusion. Katie, Diana, and Manny were all in the bottom three because their chicken had been the worse in the pressure test. And out of three that were in the bottom, the judges decided to eliminate Manny the firefighter tonight!